U2 are still working on their new album, No Line On The Horizon, but they're already plotting a massive 18-month world tour, part of which calls for three huge summer concerts at Dublin's Croke Park Stadium. After four years away from the concert scene, U2 will salute their comeback by playing three shows at the 82,000-capacity stadium. "They want to rock Croker for three nights," says a source close to the group. "They have been planning this comeback for a long time and the ultimate way to mark their homecoming is with a string of live shows in Ireland's most spectacular venue. They will have no problem selling all the nights out and there's even rumors that they could end up playing for four or even five evenings - if they can get permission for the extra nights." The tour will kick early next year in the US to accompany the release of a new album in January - three months later than they had originally planned. 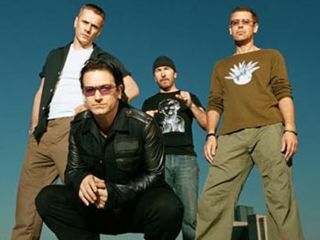 As MusicRadar reported earlier, Bono said the band are on a creative roll and don't want to stop prematurely. "We've hit a rich song writing vein. It gets a bit dark down here but looks like we've found diamonds not coal. I thought a while back we might have the album wrapped by now but why come up above ground now if there's more priceless stuff to be found? It's been maddening. There have been injuries and recoveries, no babies born that I know of, but this one is nearly ready for the new year of 2009." U2 said they are choosing from 50 to 60 tracks they've written during sessions in Morocco, Dublin and France and they believe the new album will be a departure for the group.